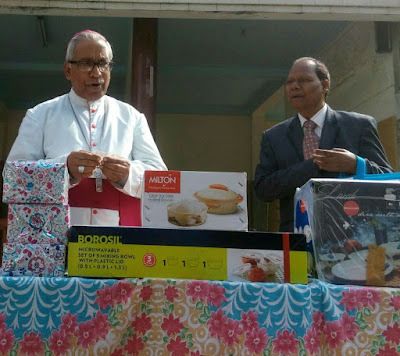 In order to spread the awareness on the necessity of a parish news bulletin, AUXILIUM SPEAKS, the monthly newsletter of Auxilium Parish, organised a Lucky Draw on its December 2015 Issue. As per the archdiocese website, the parish has 10,000+ multi-cultural population, and has therefore immense possibilities of all-round development though effective communication. The Lucky Draw was conducted in the presence of his Grace Archbishop Thomas D’ Souza who picked up the coupon for the first prize. CONGRALULATIONS TO ALL THE WINNERS! His Grace picks up the 1st Prize Winner’s name (Prakash Rai, Coupon No. 462).